For other uses, see Aniline (disambiguation). Aniline is a slightly pyramidalized molecule, with hybridization of the nitrogen somewhere between sp3 and sp2. The amine is flatter than an aliphatic amine, owing to conjugation of the lone pair with the aryl substituent. Thus, the experimental geometry reflects a balance between the stabilization of lone pairs in orbitals with higher s character and better stabilization via conjugation with the aryl ring for an orbital of pure p character. The pyramidalization angle between the C–N bond and the bisector of the H–N–H angle is 142.5°. (For comparison, in more strongly pyramidal methylamine, this value is ~125°, while a planar nitrogen like that of formamide has an angle of 180°.) The C−N distance is correspondingly shorter. In aniline, the C−N and C−C distances are close to 1.39 Å, indicating the π-bonding between N and C.
The reduction of nitrobenzene to aniline was first performed by Nikolay Zinin in 1842, using inorganic sulfide as a reductant (Zinin reaction). Aniline can alternatively be prepared from ammonia and phenol derived from the cumene process. In commerce, three brands of aniline are distinguished: aniline oil for blue, which is pure aniline; aniline oil for red, a mixture of equimolecular quantities of aniline and ortho- and para-toluidines; and aniline oil for safranine, which contains aniline and ortho-toluidine and is obtained from the distillate (échappés) of the fuchsine fusion. The chemistry of aniline is rich because the compound has been cheaply available for many years. 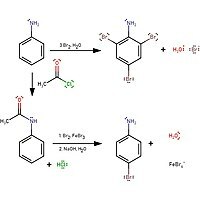 Below are some classes of its reactions. The oxidation of aniline has been heavily investigated, and can result in reactions localized at nitrogen or more commonly results in the formation of new C-N bonds. In alkaline solution, azobenzene results, whereas arsenic acid produces the violet-coloring matter violaniline. Chromic acid converts it into quinone, whereas chlorates, in the presence of certain metallic salts (especially of vanadium), give aniline black. Hydrochloric acid and potassium chlorate give chloranil. Potassium permanganate in neutral solution oxidizes it to nitrobenzene, in alkaline solution to azobenzene, ammonia and oxalic acid, in acid solution to aniline black. Hypochlorous acid gives 4-aminophenol and para-amino diphenylamine. Oxidation with persulfate affords a variety of polyanilines compounds. These polymers exhibit rich redox and acid-base properties. Polyanilines can form upon oxidation of aniline. Like phenols, aniline derivatives are highly susceptible to electrophilic substitution reactions. Its high reactivity reflects that it is an enamine, which enhances the electron-donating ability of the ring. For example, reaction of aniline with sulfuric acid at 180 °C produces sulfanilic acid, H2NC6H4SO3H. The reaction to form 4-bromoaniline is to protect the amine with acetyl chloride, then hydrolyse back to reform aniline. The resulting diamine is the precursor to 4,4'-MDI and related diisocyanates. Aniline is a weak base. Aromatic amines such as aniline are, in general, much weaker bases than aliphatic amines. Aniline reacts with strong acids to form anilinium (or phenylammonium) ion (C6H5-NH3+). The nitrogen's electron was delocalized to the ring. This is why that aniline is less basic than most amines. Missing in such analysis is consideration of solvation. Aniline is, for example, more basic than ammonia in the gas phase, but ten thousand times less so in aqueous solution. Aniline reacts with acyl chlorides such as acetyl chloride to give amides. The amides formed from aniline are sometimes called anilides, for example CH3-CO-NH-C6H5 is acetanilide. At high temperatures aniline and carboxylic acids react to give the anilides. N-Methylaniline and dimethylaniline are colorless liquids with boiling points of 193–195 °C and 192 °C, respectively. These derivatives are of importance in the color industry. Aniline combines directly with alkyl iodides to form secondary and tertiary amines. Boiled with carbon disulfide, it gives sulfocarbanilide (diphenylthiourea) (CS(NHC6H5)2), which may be decomposed into phenyl isothiocyanate (C6H5CNS), and triphenyl guanidine (C6H5N=C(NHC6H5)2). Aniline and its ring-substituted derivatives react with nitrous acid to form diazonium salts. Through these intermediates, aniline can be conveniently converted to -OH, -CN, or a halide via Sandmeyer reactions. This diazonium salt can also be reacted with NaNO2 and phenol to produce a dye known as benzeneazophenol, in a process called coupling. It reacts with nitrobenzene to produce phenazine in the Wohl-Aue reaction. Hydrogenation gives cyclohexylamine. Being a standard reagent in laboratories, aniline is used for many niche reactions. Its acetate is used in the Aniline acetate test for carbohydrates, identifying pentoses by conversion to furfural. It is used to stain neural RNA blue in the Nissl stain. The largest application of aniline is for the preparation of methylene dianiline and related compounds by condensation with formaldehyde. The diamines are condensed with phosgene to give methylene diphenyl diisocyanate, a precursor to urethane polymers. Most aniline is consumed in the production of methylenedianiline, a precursor to polyurethanes. Other uses include rubber processing chemicals (9%), herbicides (2%), and dyes and pigments (2%). As additives to rubber, aniline derivatives such as phenylenediamines and diphenylamine, are antioxidants. Illustrative of the drugs prepared from aniline is paracetamol (acetaminophen, Tylenol). The principal use of aniline in the dye industry is as a precursor to indigo, the blue of blue jeans. Cake of indigo dye, which is prepared from aniline. Aniline is also used at a smaller scale in the production of the intrinsically conducting polymer polyaniline. Some early American rockets, such as the Aerobee and WAC Corporal, used aniline with furfuryl alcohol as a fuel with nitric acid as an oxidizer. The combination is hypergolic, igniting on contact between fuel and oxidizer. It is also dense, and can be stored for extended periods. Aniline was first isolated in 1826 by Otto Unverdorben by destructive distillation of indigo. He called it Crystallin. In 1834, Friedlieb Runge isolated a substance from coal tar that turned a beautiful blue color when treated with chloride of lime. He named it kyanol or cyanol. In 1840, Carl Julius Fritzsche (1808–1871) treated indigo with caustic potash and obtained an oil that he named aniline, after an indigo-yielding plant, anil (Indigofera suffruticosa). In 1842, Nikolay Nikolaevich Zinin reduced nitrobenzene and obtained a base that he named benzidam. In 1843, August Wilhelm von Hofmann showed that these were all the same substance, known thereafter as phenylamine or aniline. In 1856, whilst trying to synthesise quinine, von Hofmann's student William Henry Perkin discovered mauveine and went into industry producing the first commercial synthetic dye. Other aniline dyes followed, such as fuchsin, safranin, and induline. At the time of mauveine's discovery, aniline was expensive. Soon thereafter, applying a method reported in 1854 by Antoine Béchamp, it was prepared "by the ton". The Béchamp reduction enabled the evolution of a massive dye industry in Germany. Today, the name of BASF, originally Badische Anilin- und Soda-Fabrik (English: Baden Aniline and Soda Factory), now the largest chemical supplier, echoes the legacy of the synthetic dye industry, built via aniline dyes and extended via the related azo dyes. The first azo dye was aniline yellow. In the late 19th century, aniline emerged as an analgesic drug, its cardiac-suppressive side effects countered with caffeine. During the first decade of the 20th century, while trying to modify synthetic dyes to treat African sleeping sickness, Paul Ehrlich – who had coined the term chemotherapy for his magic bullet approach to medicine – failed and switched to modifying Béchamp's atoxyl, the first organic arsenical drug, and serendipitously obtained a treatment for syphilis – salvarsan – the first successful chemotherapy agent. Salvarsan's targeted microorganism, not yet recognized as a bacterium, was still thought to be a parasite, and medical bacteriologists, believing that bacteria were not susceptible to the chemotherapeutic approach, overlooked Alexander Fleming's report in 1928 on the effects of penicillin. In 1932, Bayer sought medical applications of its dyes. Gerhard Domagk identified as an antibacterial a red azo dye, introduced in 1935 as the first antibacterial drug, prontosil, soon found at Pasteur Institute to be a prodrug degraded in vivo into sulfanilamide – a colorless intermediate for many, highly colorfast azo dyes – already with an expired patent, synthesized in 1908 in Vienna by the researcher Paul Gelmo for his doctoral research. By the 1940s, over 500 related sulfa drugs were produced. Medications in high demand during World War II (1939–45), these first miracle drugs, chemotherapy of wide effectiveness, propelled the American pharmaceutics industry. In 1939, at Oxford University, seeking an alternative to sulfa drugs, Howard Florey developed Fleming's penicillin into the first systemic antibiotic drug, penicillin G. (Gramicidin, developed by René Dubos at Rockefeller Institute in 1939, was the first antibiotic, yet its toxicity restricted it to topical use.) After World War II, Cornelius P. Rhoads introduced the chemotherapeutic approach to cancer treatment. In the 1940s and early 1950s, aniline was used with nitric acid or dinitrogen tetroxide as rocket fuel for small missiles and the Aerobee rocket. The two fuel components are hypergolic, producing a violent reaction on contact. Aniline was later replaced by hydrazine. Aniline is toxic by inhalation of the vapour, ingestion, or percutaneous absorption. The IARC lists it in Group 3 (not classifiable as to its carcinogenicity to humans) due to the limited and contradictory data available. The early manufacture of aniline resulted in increased incidents of bladder cancer, but these effects are now attributed to naphthylamines, not anilines. Aniline has been implicated as one possible cause of forest dieback. Many methods exist for the detection of aniline. ^ Nomenclature of Organic Chemistry : IUPAC Recommendations and Preferred Names 2013 (Blue Book). Cambridge: The Royal Society of Chemistry. 2014. pp. 416, 668. doi:10.1039/9781849733069-FP001. ISBN 978-0-85404-182-4. Aniline, for C6H5-NH2, is the only name for a primary amine retained as a preferred IUPAC name for which full substitution is permitted on the ring and the nitrogen atom. It is a Type 2a retained name; for the rules of substitution see P-15.1.8.2. Substitution is limited to substituent groups cited as prefixes in accordance with the seniority of functional groups explicitly expressed or implied in the functional parent compound name. The name benzenamine may be used in general nomenclature. ^ a b c d e NIOSH Pocket Guide to Chemical Hazards. "#0033". National Institute for Occupational Safety and Health (NIOSH). ^ a b c "Aniline". Immediately Dangerous to Life and Health Concentrations (IDLH). National Institute for Occupational Safety and Health (NIOSH). ^ GOV, NOAA Office of Response and Restoration, US. "ANILINE | CAMEO Chemicals | NOAA". cameochemicals.noaa.gov. Retrieved 2016-06-16. ^ 1937-, Carey, Francis A., (2008). Organic chemistry (7th ed.). Boston: McGraw-Hill Higher Education. ISBN 9780073047874. OCLC 71790138. ^ G. M. Wójcik "Structural Chemistry of Anilines" in Anilines (Patai's Chemistry of Functional Groups), S. Patai, Ed. 2007, Wiley-VCH, Weinheim. doi:10.1002/9780470682531.pat0385. ^ a b c d Chisholm 1911, p. 48. ^ "Aniline". The Chemical Market Reporter. Archived from the original on 2002-02-19. Retrieved 2007-12-21. ^ Otto Unverdorben (1826). "Ueber das Verhalten der organischen Körper in höheren Temperaturen" [On the behaviour of organic substances at high temperatures]. Annalen der Physik und Chemie. 8 (11): 397–410. Bibcode:1826AnP....84..397U. doi:10.1002/andp.18260841109. ^ F. F. Runge (1834) "Ueber einige Produkte der Steinkohlendestillation" (On some products of coal distillation), Annalen der Physik und Chemie, 31 : 65–77 (see page 65), 513–524; and 32 : 308–332 (see page 331). J. Fritzsche (1840) "Ueber das Anilin, ein neues Zersetzungsproduct des Indigo", Journal für praktische Chemie, 20 : 453–457. In a postscript to this article, Erdmann (one of the journal's editors) argues that aniline and the "cristallin", which was found by Unverdorben in 1826, are the same substance ; see pages 457–459. 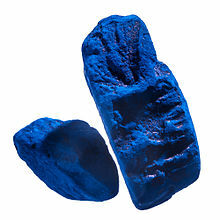 ^ synonym I anil, ultimately from Sanskrit "nīla", dark-blue. ^ N. Zinin (1842). "Beschreibung einiger neuer organischer Basen, dargestellt durch die Einwirkung des Schwefelwasserstoffes auf Verbindungen der Kohlenwasserstoffe mit Untersalpetersäure" (Description of some new organic bases, produced by the action of hydrogen sulfide on compounds of hydrocarbons and hyponitric acid [H2N2O3]), Bulletin Scientifique [publié par l'Académie Impériale des Sciences de Saint-Petersbourg], 10 (18) : 272–285. Reprinted in: N. Zinin (1842) "Beschreibung einiger neuer organischer Basen, dargestellt durch die Einwirkung des Schwefelwasserstoffes auf Verbindungen der Kohlenwasserstoffe mit Untersalpetersäure," Journal für praktische Chemie, 27 (1): 140–153. Benzidam is named on page 150. Fritzsche, Zinin's colleague, soon recognized that "benzidam" was actually aniline. See: Fritzsche (1842) Bulletin Scientifique, 10 : 352. Reprinted as a postscript to Zinin's article in: J. Fritzsche (1842) "Bemerkung zu vorstehender Abhandlung des Hrn. Zinin" (Comment on the preceding article by Mr. Zinin), Journal für praktische Chemie, 27 (1) : 153. See also: (Anon.) (1842) "Organische Salzbasen, aus Nitronaphtalose und Nitrobenzid mittelst Schwefelwasserstoff entstehend" (Organic bases originating from nitronaphthalene and nitrobenzene via hydrogen sulfide), Annalen der Chemie und Pharmacie, 44 : 283–287. ^ August Wilhelm Hofmann (1843) "Chemische Untersuchung der organischen Basen im Steinkohlen-Theeröl" (Chemical investigation of organic bases in coal tar oil), Annalen der Chemie und Pharmacie, 47 : 37–87. On page 48, Hofmann argues that krystallin, kyanol, benzidam, and aniline are identical. ^ Perkin, William Henry. 1861-06-08. "Proceedings of Chemical Societies: Chemical Society, Thursday, May 16, 1861." The Chemical News and Journal of Industrial Science. Retrieved on 2007-09-24. ^ Auerbach G, "Azo and naphthol dyes", Textile Colorist, 1880 May;2(17):137-9, p 138. ^ Wilcox RW, "The treatment of influenza in adults", Medical News, 1900 Dec 15;77():931-2, p 932. ^ a b c D J Th Wagener, The History of Oncology (Houten: Springer, 2009), pp 150–1. ^ John E Lesch, The First Miracle Drugs: How the Sulfa Drugs Transformed Medicine (New York: Oxford University Press, 2007), pp 202–3. ^ "Medicine: Spoils of war", Time, 15 May 1950. ^ Muir, GD (ed.) 1971, Hazards in the Chemical Laboratory, The Royal Institute of Chemistry, London. ^ The Merck Index. 10th ed. (1983), p.96, Rahway: Merck & Co.
^ Krahl-Urban, B., Papke, H.E., Peters, K. (1988) Forest Decline: Cause-Effect Research in the United States of North America and Federal Republic of Germany. Germany: Assessment Group for Biology, Ecology and Energy of the Julich Nuclear Research Center. Wikimedia Commons has media related to Aniline. Look up aniline in Wiktionary, the free dictionary.